This is my first blog entry and I think a good place to start is a question: for whom do we make audio equipment? You might think we make it for audiophiles, but that is not the case. In the past we have done two audio shows, although I’ve helped friends on a number of others. In the US, these audio shows are held in hotels, and the exhibitors set up their equipment in rooms emptied of their beds and furniture. The shows are attended by men in their 60’s by and large, women are only there accompanying their husbands (the shows even organize bus trips for the bored wives to go shopping). If you could sum up the average attendee, he would be an orthodontist from Illinois. People would enter our room with a poker face betraying no reaction. This is how serious audiophiles behave, and like the reviewers they read in audio magazines, they want to appear impartial. They listen with their minds, not with their ears and bodies. Because of that, in the brief process of listening to an unknown system (OMA’s for example) what really happens is a mental process of retrieving everything they ever read or heard about things like horns, low powered triode tube amps, vinyl. That information is then used to “listen” to the music played. This is not a happy process, and you can see it on their faces. We just did the ICFF (International Contemporary Furniture Fair) in New York City this last week. It’s the biggest show of its kind in North America, probably the biggest anywhere outside of the Salon del Mobile in Milan. It was an incredible experience. We’ve never done this kind of show before. People attending had no background in audio (mostly) and had no preconceptions. The OMA booth was thronged pretty much all day every day, playing music of all different genres, from baroque classical played on period instruments to Michael Jackson and Kraftwerk. You might wonder what our neighboring booths thought about that, especially as the sound sometimes was rather loud (you can’t play Billie Jean anything but loud). I was a bit worried about this in the beginning, to be honest. But booth owners surrounding us were so enthusiastic about what we were doing, and playing, that we started fielding requests for the next day’s playlist. At show’s end, our closest neighbors asked if we would keep the same booth placement for next year’s show…. From my perch on the outside corner of our booth, I could watch people’s reactions. Incredulity is a very interesting thing to see on someone’s face. The mouth really does go agape. My favorite thing is what happens next- an involuntary, unconscious smile appears. The kind of smile that little babies have when delighted. This is a really beautiful thing to see, especially on otherwise jaded design professionals, architects, and the like. These people simply listened. They had never heard music properly, beautifully reproduced. They had never read years of audio magazine articles explaining why they should not trust their senses, and rely on the experts who make their living “reviewing” an endless parade of the same conventional audio equipment. These are the people, in short, for whom OMA makes audio equipment. People whose ability to hear has not been impaired by their minds. In future posts, I’ll talk more about what audiophiles are really doing in their audiophilia, but I can assure you, it’s not listening to music. It’s listening to their equipment. 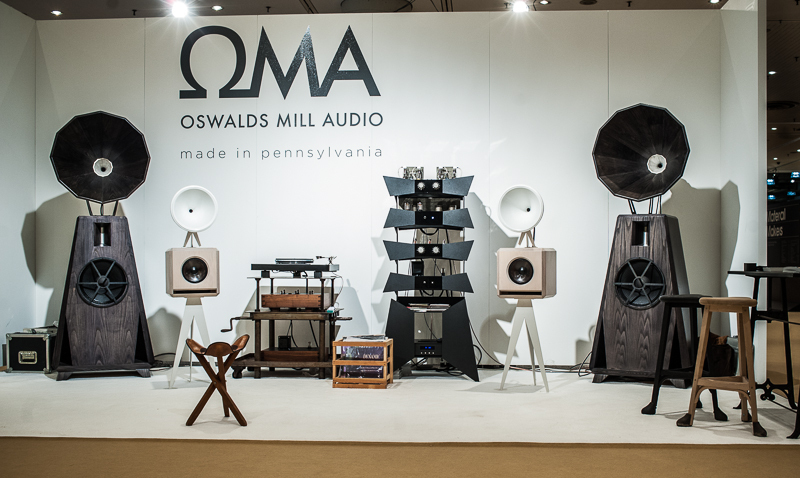 One last thing- at ICFF, half the people who wanted to talk with me about the sound were…. women. Posted in OMA on May 25, 2013 by Jonathan Weiss.